Mar 14, 2019 – What Will the BC Budget 2019 Mean to You? Jan. 31, 2019 – What Lies Ahead for the Development Industry in the Okanagan in 2019? (CPD Approved) – View presentation. Mar 21, 2019 CMHC Spring Housing Forecast to be held at Coast Capri Hotel, Kelowna. Oct 25, 2018 – CMHC’s Annual Forecast Luncheon (CPD Approved) – View presentation. May 31, 2018 – Legends of UDI Luncheon View presentation. Mar. 14, 2018 – UDI Luncheon: Housing, Consumption & Business Investment: BC’s Shifting Economic Landscape (CPD Approved) – View presentation. February 26, 2018 – UDI Luncheon: What is the Next Era of Land Use Approvals? (CPD Approved) – View presentation. Jan. 25, 2018 – UDI Luncheon: What Lies Ahead for the Development Industry in the Okanagan in 2018? (CPD Approved) – View presentation. October 26, 2017 2017 UDI Luncheon: This Changes Everything – 40,000 People Told Us What Motivates Them Most (CPD Approved) – View presentation. September 28, 2017 2017 CMHC’s Annual Forecast Luncheon with Taylor Pardy (CPD Approved) – View presentation. May 30, 2017 UDI Luncheon: Embracing Technology in the Real Estate Development Industry View presentation. Apr. 25, 2017 UDI Luncheon: Kelowna’s Housing Market: How Much Vancouver, How Much Calgary? View presentation. Mar. 17, 2017 UDI Luncheon: The Future of BC and the Okanagan View presentation. Feb. 24, 2017 UDI Luncheon: Oil & Gas Industry Outlook & What That Means for Real Estate Development View presentation. Oct. 27, 2016 UDI Luncheon: The Stackable Boomer with David Allison View presentation. Oct. 13, 2016 UDI FortisBC Breakfast View presentation. Sept. 29, 2016 CMHC Forecast Luncheon with Taylor Pardy View presentation. Feb. 25, 2016 UDI Luncheon: Important Trends You Need to Know About Urban Infill Retail Development with Chris Beza from Callison View presentation. Jan. 28, 2016 UDI Luncheon: What You Need to Know About the Development Industry in BC in 2016 View presentation. Oct – Dec 2016 Upcoming High Performance Building Courses and Events: Brought to you by Passive House Canada. The building landscape is changing worldwide and the Passive House Standard is being inked into building codes, as the proven best way to build for comfort and energy efficiency. Sep 16, 2016 8th Annual ACEC-British Columbia Okanagan Golf Tournament, Harvest Golf Club, Kelowna BC. Sep 15, 2016 FortisBC Trade Ally Network 2016 Trade Show, Kelowna BC. May 19, 2016 City of Vernon Housing Forum, Schubert Centre, Vernon BC. April 19, 2016 Kelowna Chamber AGM featuring keynote Sylvia Bosa, Bosa Properties Foundation, Delta Grand Okanagan Resort & Conference Centre, Kelowna BC. Note: UDI Okanagan Members can attend at Member cost. Nov. 19, 2015 UDI Luncheon: The Post-Election Economic Landscape and What That Means for Real Estate View presentation. Sept. 24, 2015 CMHC’s Annual Forecast Luncheon with Robyn Adamache View presentation. May 28, 2015 UDI Luncheon & AGM: Bob Rennie Luncheon – Can We Solve Affordability Without Density? Apr. 23, 2015 UDI Luncheon: The Urban Food Revolution: Changing the Way We Design Cities View presentation. Jan. 29, 2015 UDI Luncheon: What You Need to Know about the Development Industry in BC in 2015 View presentation. Date and time: Thursday, Oct. 29, 5 to 6 p.m. – doors open at 4:30 p.m. Reception and book signing to follow. Tickets: $25 / $15 for students – only 160 tickets available through the Rotary Centre for the Arts box office or online at www.selectyourtickets.com. June 5, 2015 FortisBC Trade Ally Network- 2015 New Home Construction Trade Show, Kelowna. Pathways to Net-Zero Buildings in B.C. The Pembina Institute in conjunction with our lead sponsors — the Real Estate Foundation of British Columbia and TD Bank — is pleased to extend to you an invitation to our Thought Leader Forum: Pathways to Net-Zero Buildings in B.C. This is not a conference. It is an opportunity for a frank conversation about what works and what does not in public policy for high-performance new commercial and multi-residential buildings in B.C. In a roll-up-your-sleeves environment, we will test policies, clarify challenges and identify areas of consensus. As a leader in your field, we need your input to help to shape B.C.’s pathway toward a net-zero buildings policy. The forum will include representatives from provincial and local governments, developers, builders, contractors, utilities, architects, engineers, research institutions, non-government organizations and labour groups. This invitation-only two-day event will build on the foundational work of the Pacific Northwest Economic Region, the Integral Group, the New Buildings Institute, the Lighthouse Building Centre, the Cascadia Green Building Council and others to help chart a course for net-zero buildings in B.C. Don’t miss out on this opportunity to shape B.C.’s net-zero buildings policy! 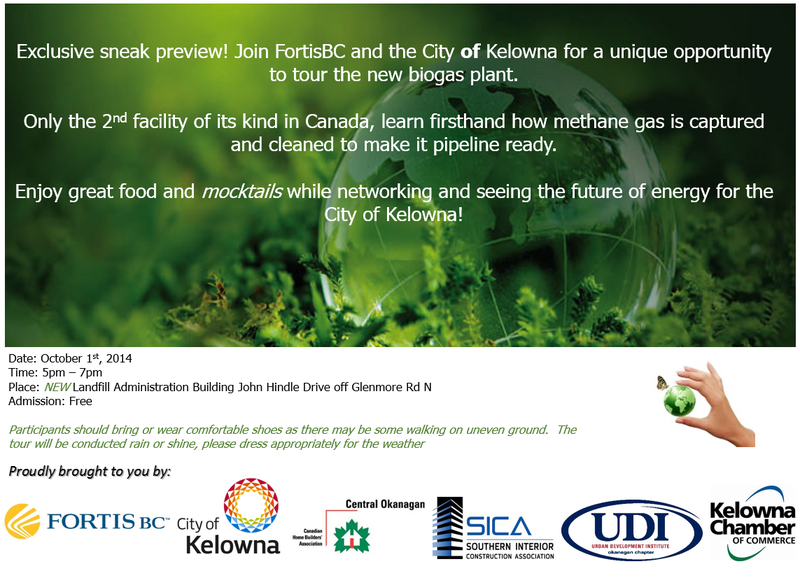 This is event is open to UDI Okanagan members on a first come, first serve basis while seats last. An early RSVP is appreciated. A formal invitation is coming soon, but confirming your attendance now will help with planning. If you are unable to attend, please let us know as soon as possible as there is already a wait list for this event. April 15, 2015 ACEC British Columbia: Beyond the Vineyard: Future Business Opportunities in BC’s Southern Interior at the Delta Grand Resort, Kelowna. Come learn about how the City’s development processes run. Starting with a big picture explanation of the Official Community Plan and Zoning, to the intricacies of Subdivision and Development Permits. Kelowna’s staff will explain how different processes work and how to navigate them efficiently. City Hall – April 9th session will take place in Knox Mtn Boardroom (4th floor). May 27th session will take place in Council Chambers. April 9, 2015 CHBA Canadian Home Builders Association: Bright Horizons Building for Skills: Okanagan College, Kelowna. February 18, 2015 Levelton Breakfast Seminar: Hazardous Materials at Marriott Fairfield Inn, Kelowna. 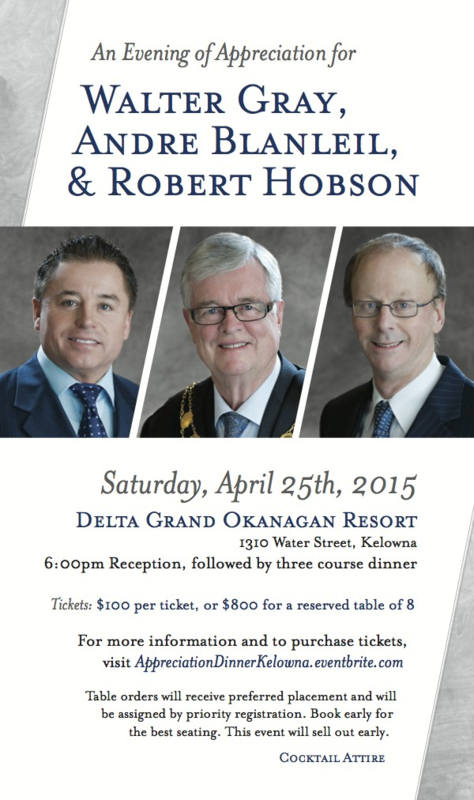 February 14, 2015 CHBC 23rd Annual Tommie Awards at Delta Grand Waterfront Hotel, Kelowna. May 29, 2014 Epic Shift: A Fireside Chat with Ben Smith, VP Sales & Marketing with Rennie Marketing Systems View Presentation. Sept. 25, 2014 CMHC’s Annual Forecast Luncheon with Sarena Teakles and Robyn Adamache View Presentation by Robyn Adamache. View Presentation by Sarena Teakles. Nov. 20, 2014 For Those About to Hike – We Salute You View Presentation.